Do you ever ponder where inspiration comes from? I enjoy thinking about that sometimes...looking at things I've made and reflecting on where the idea came from. 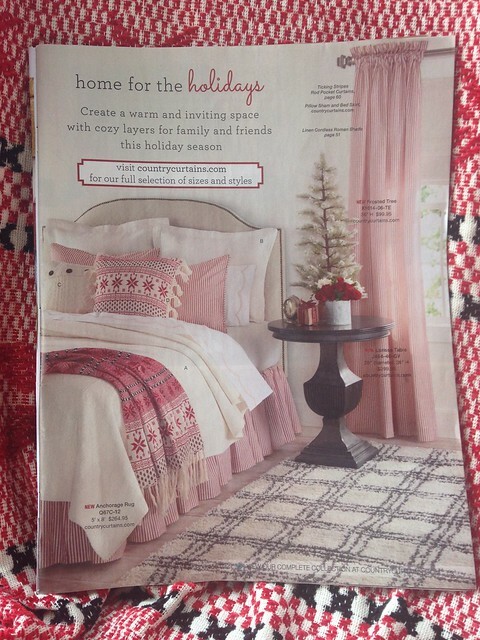 Early last fall I received a Country Curtains catalog and saw this picture of a cozy and inviting Christmas bedroom. 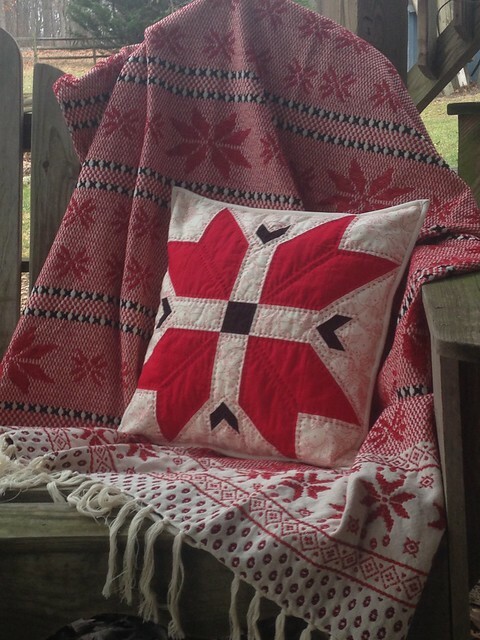 I was dreaming of how perfect something this look would be in the guest room of our log home :o) I just knew that great Nordic throw would be the perfect companion for my All Points North quilt block. 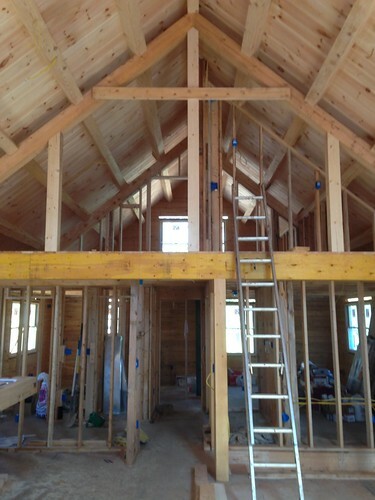 I purposely kept my Christmas making to a minimum this year because of all the time being spent on preparations for our log home. However, if you're a maker then you know it just doesn't feel like Christmas if you don't have at least one handmade gift to give ;o) This pillow was a nice project to occupy myself during the evenings between Thanksgiving and Christmas. Deep saturated reds and inky black fabrics gave a nice crisp look to this Nordic-style block. 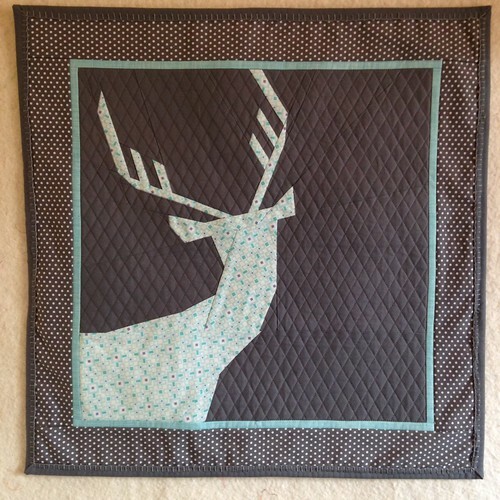 The background fabric was a fun departure from my comfort zone - my first inclination was to play it safe and use Kona bone (a solid fabric), but I have long admired printed background fabric in the work of others. I decided to go for it and pulled from my stash the red/cream Purebred Derby Preakness paint-by-number fabric from one of my favorite designers, Erin Michael. 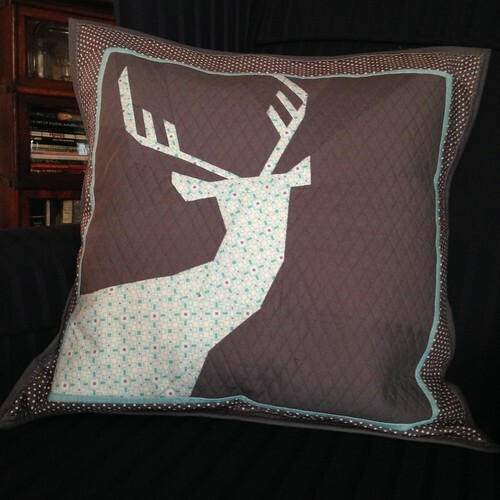 It adds a fun layer of dimension to the pillow. 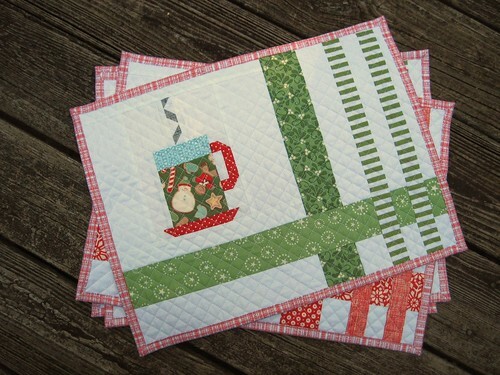 The beautiful hand work of Mary Dugan (Molly Flanders Makes blog) enticed me to quilt this with big stitches using perle 8 cotton. 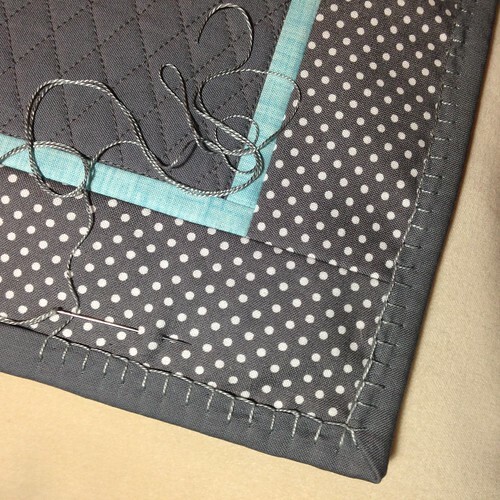 Hand quilting is a comfortable, slow process that allows me to sit in the living room with my husband in the evenings instead of at my sewing machine. 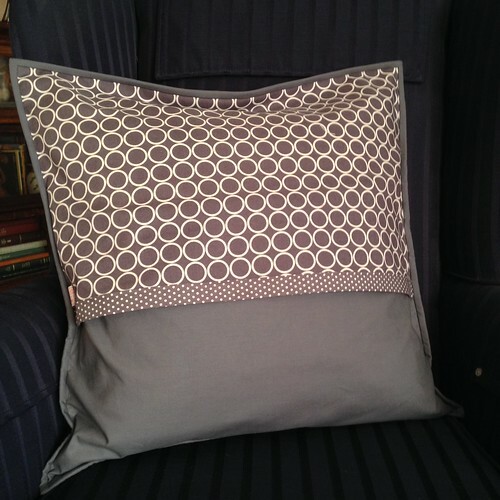 My favorite way to make a pillow back is the simple envelope style. I always plan on a generous overlap and usually use 2/3 of the pillow dimension for my fabric measurements - this ensures no pillow insert peeking out. To add just a touch of cozy to the back I added machine buttonhole stitch to sew down the binding across the back. As 2016 comes to a happy close I'm looking forward to what 2017 brings. 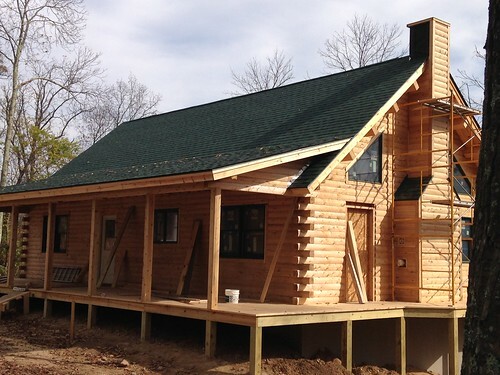 Hopefully, a move into our log home for my family! What are you hoping for in the New Year? I've never been big on pin cushions. 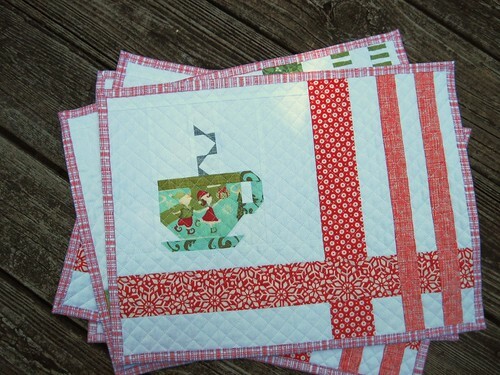 I know some quilters make them, swap them, and collect them. Nope, that's just never been me. 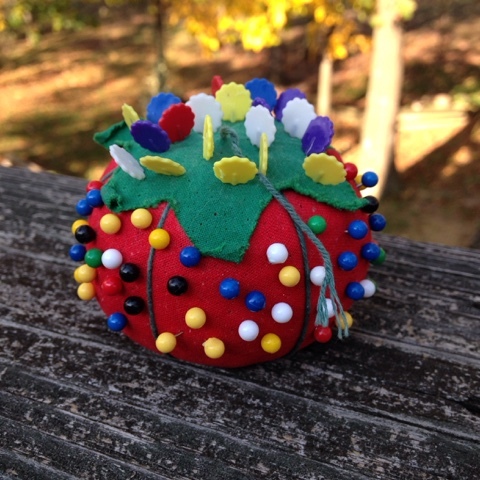 In fact, I've had the same humble tomato pin cushion given to me by my grandmother 30+ years ago when she gave me a sewing machine. It's one of those tomatoes that had a strawberry on a string that was used to sharpen pins. Well, the strawberry is long gone, but the tomato has endured. 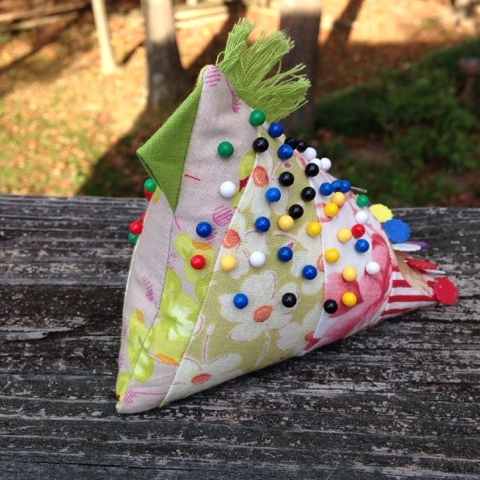 Actually, I don't even use a pin cushion as I'm sewing. Once I start pulling pins and using them I switch to a little magnetic platform that came from a museum gift shop as part of a toy. I really like to use this while I sew because I can just drop the pins on it and don't have to be concerned with sticking them into a pin cushion. However, I don't think it's a good idea to store my pins on this platform because it's too easy for them to get brushed off accidently. Complete with a sassy tail! Can you blame me for retiring the tomato? I do believe a chicken pin cushion this cute needs a name, don't you...any ideas? 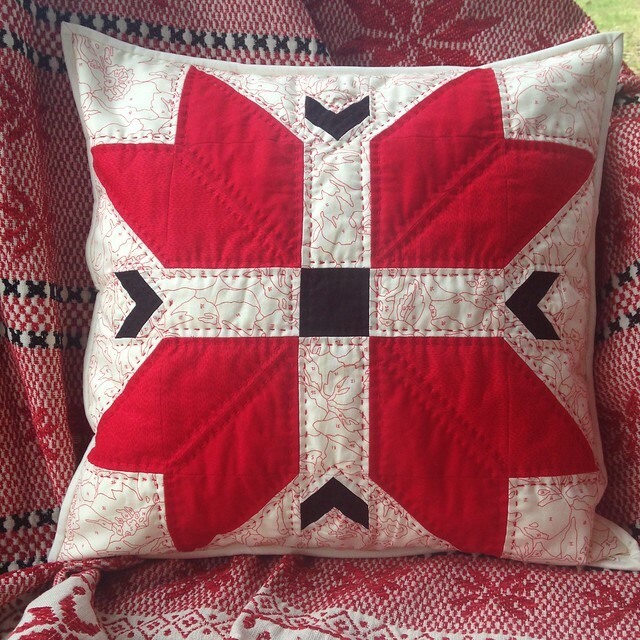 Do you remember this medallion quilt? 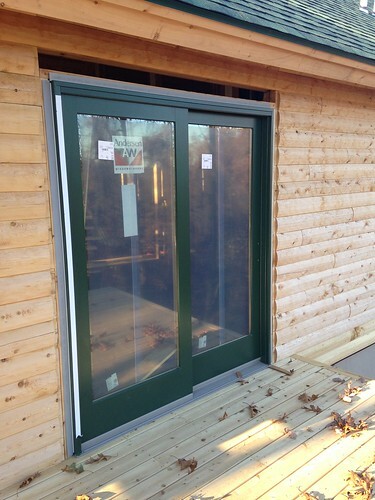 I started it six years ago with thoughts of having it finished in time for our 25th wedding anniversary. 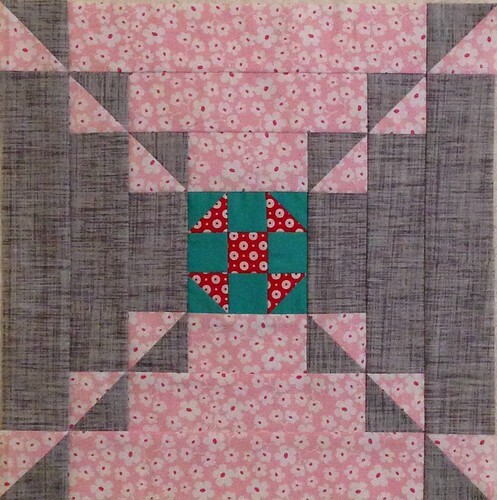 It seemed like the perfect quilt to make because it married my interest in quilting with my husbands interest in the Civil War. 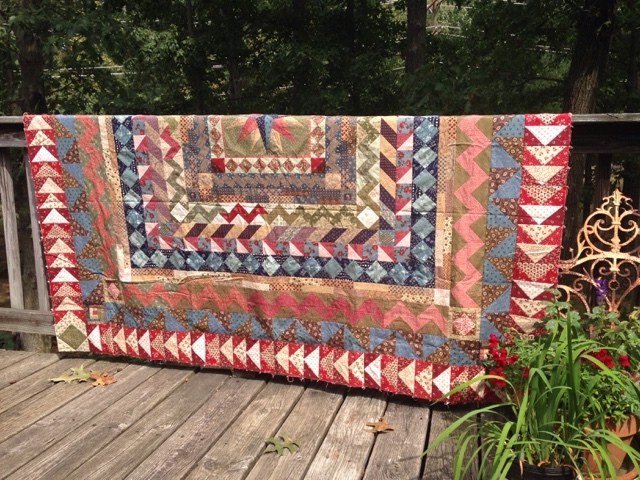 Now here we are two short weeks away from our 30th anniversary and this quilt is still not finished. 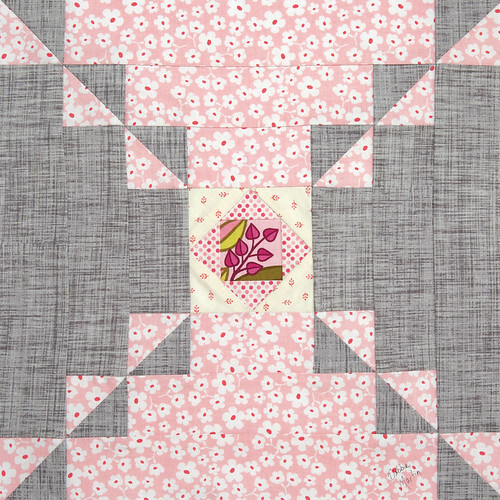 I still love the cozy use-me-everyday look of this quilt, and it has taught me so much about piecing. I really would like to get it finished. I'd love to hear about a project you've had in the works for a long time, but still want to finish. Late summer is always a fun creative time for me. My dear friend, M, has a birthday in August and I always have the best time making things for her. She and I both share a love for autumn so this year I thought I'd use the icon of all things fall-ish, the acorn, as inspiration. 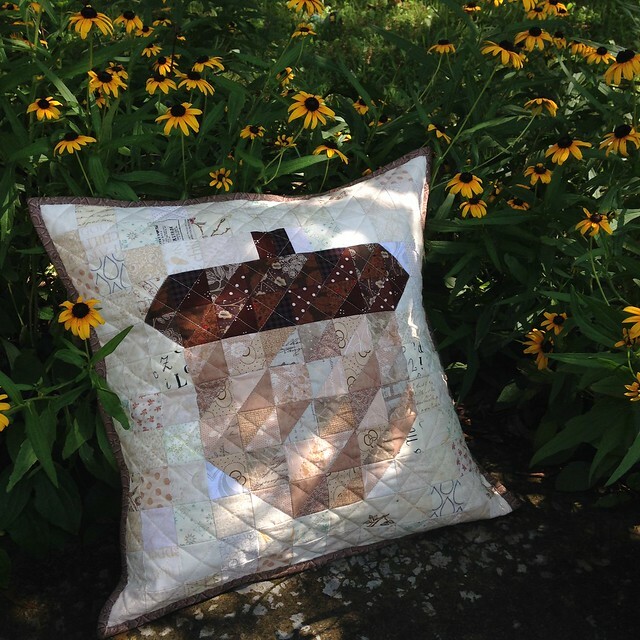 It all started when I happened across the super cute acorn patchwork pillow pattern by Bridgette of The Family Hearth. 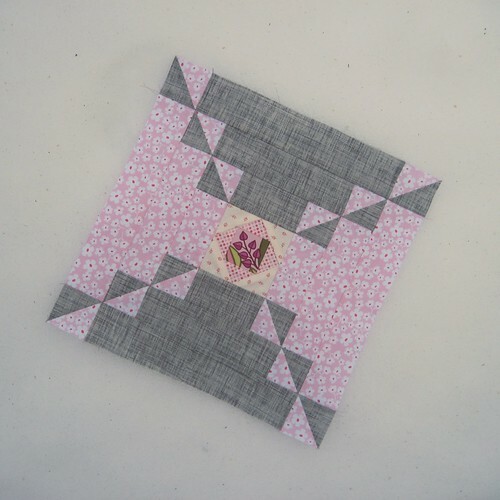 This is a great pattern for using up scraps of low volume fabric! I love the bold, graphic design! 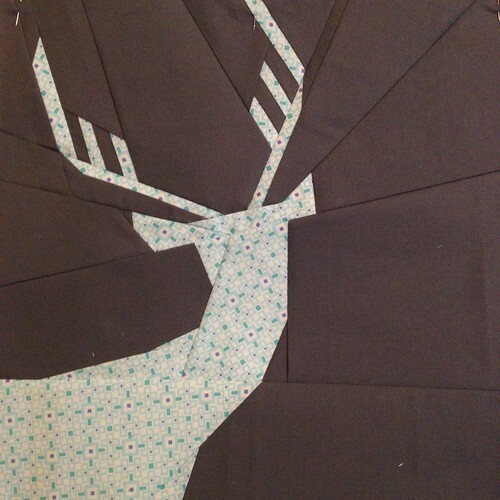 I made my pillow with a simple envelope style back. 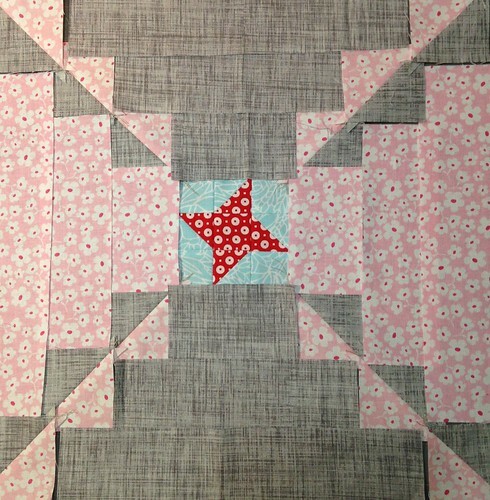 For the quilting I used masking tape to mark simple diagonal lines in order to stitch an "X" through each square. 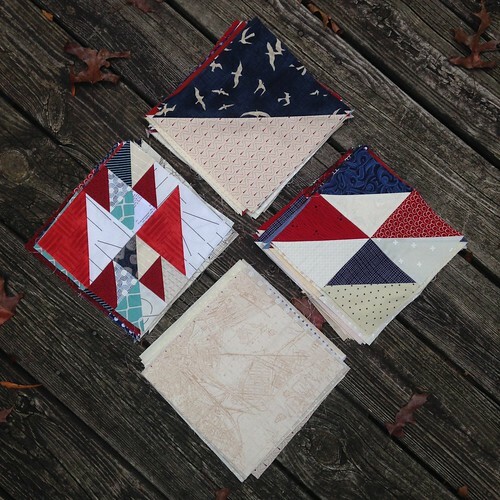 It's always so fun to quilt small projects because they fit in my Janome sewing machine without any tight pushing or pulling to get the quilting done. 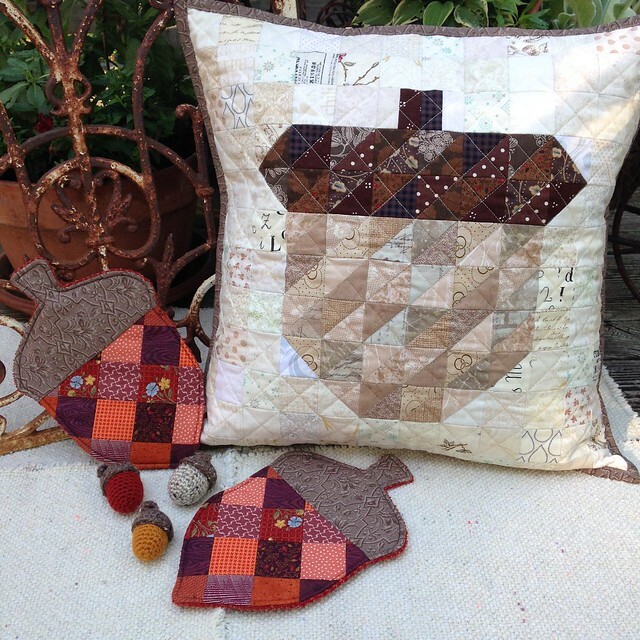 After the pillow was finished I did a bit of searching for some acorn accessories to go with it. 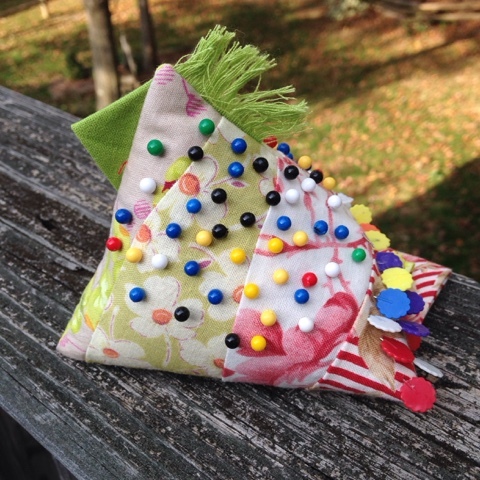 On Pinterest I found the pattern for patchwork acorn potholders made with fabric on the front and a dish towel backing. 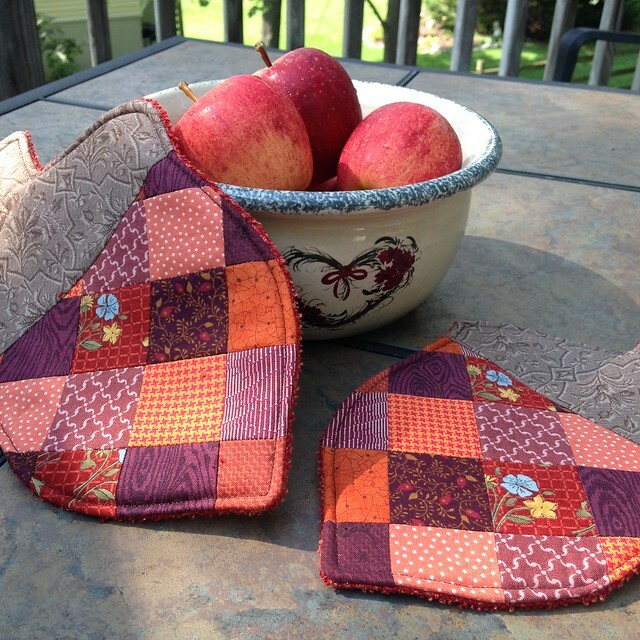 These patchwork acorn potholders by Therm-o-Web are so easy to make, and again, scraps are the name of the game! 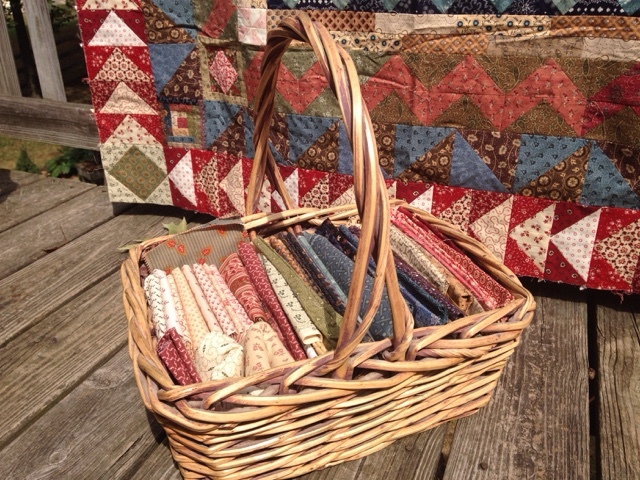 I really like how the fabric squares end up on point in the potholders. 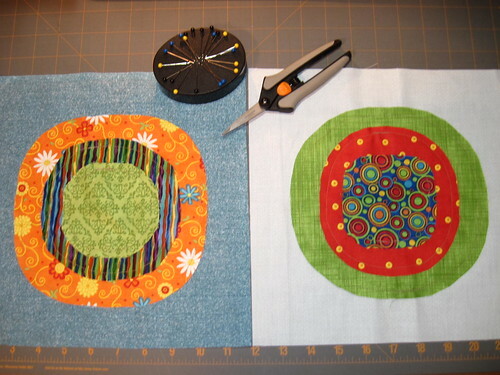 I lined them with Insul-Bright to make them more heat resistant in addition to the dish towel backs. Finally, I just wanted one more small item to tuck into the package and decided on the little crochet acorn. 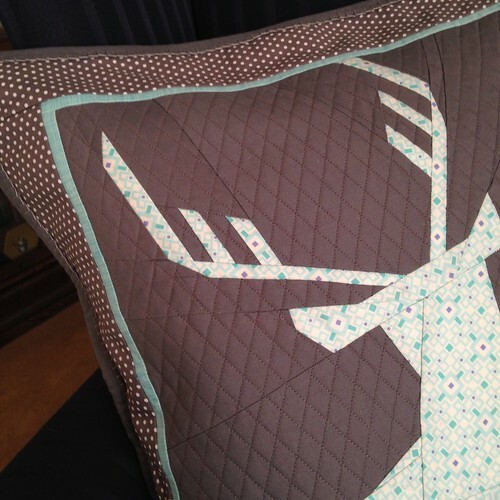 This pattern comes from Kristi of the blog Engsidrun. 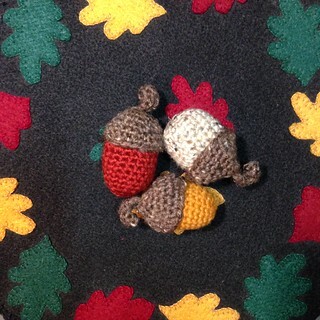 I was able to use scraps from some of my favorite yarn for these sweet little acorn. 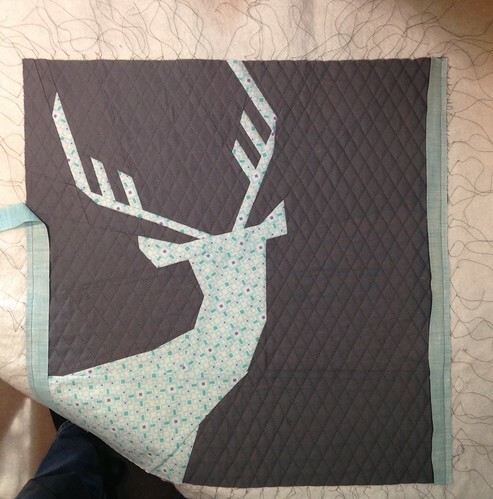 A couple weeks ago I was chatting with my friend Kelley, the owner of our local quilt shop, The Scrappy Apple, about wanting a messenger bag pattern. 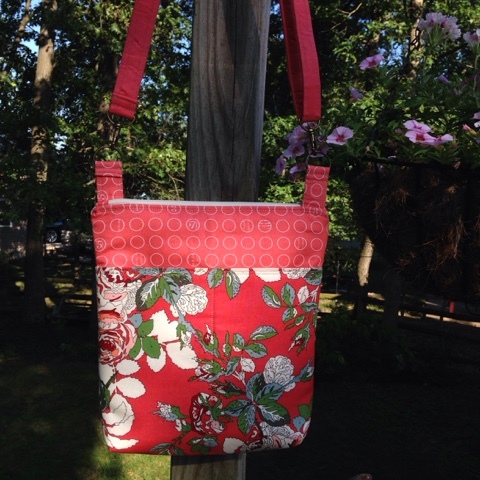 Kelley pointed me to The Barbados Bag pattern by Pink Sand Beach Designs. 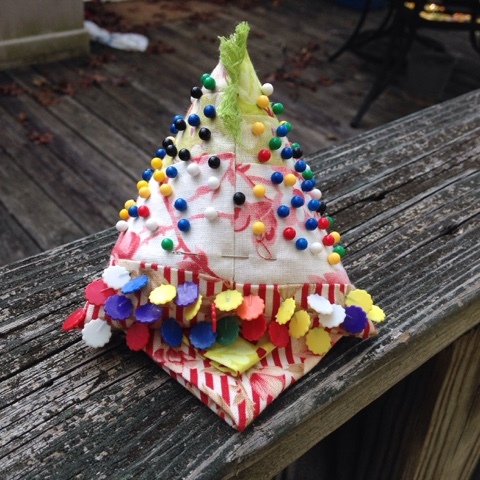 It looked like a fun pattern and well worth trying. 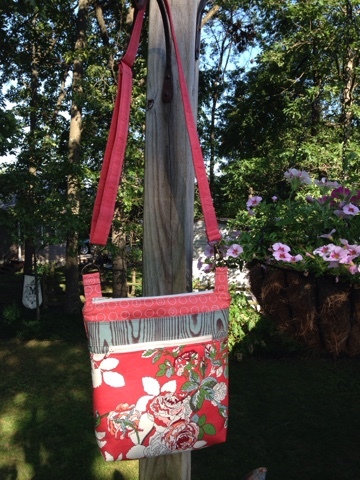 I already had the beautiful Purebred paint-by-number roses fabric (by one of my favorite designers, Erin Michael) and thought it would make a perfect late summer/early fall bag. Finding just the right accent fabrics proved to be a bit of a challenge. I purchased a couple different options before finding just what I wanted was already in my stash. 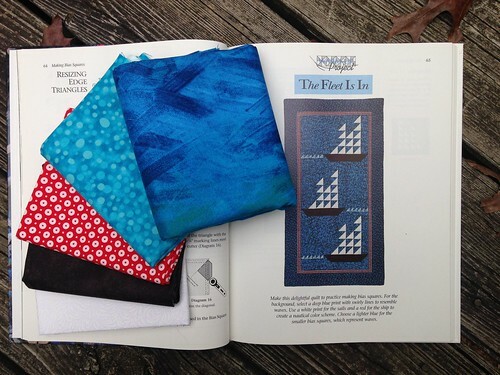 I ended up using the blue Woodgrain from Michael's first paint-by-number line, Lush. 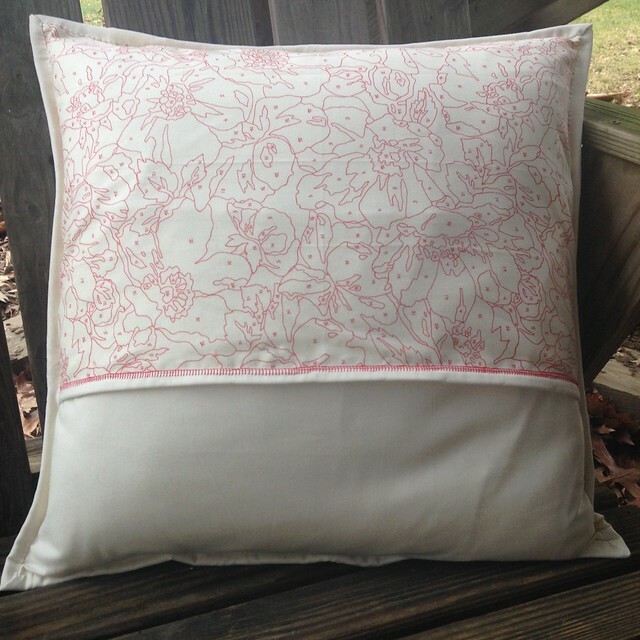 Also, the fun coral Figures fabric by Zen Chic. The front features a "hidden" pocket behind the Woodgrain fabric as well as a zippered pocket in front of it. Great pockets for stashing sun glasses! Inside I used Paint Chips, also by Erin Michael. I have a hard time envisioning how to use the Paint Chips fabric so I think a bag lining will be just right. 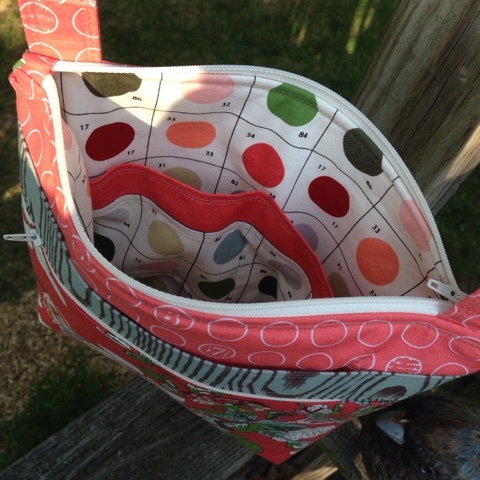 The inside also includes two pockets-perfect for a cell phone and keys. 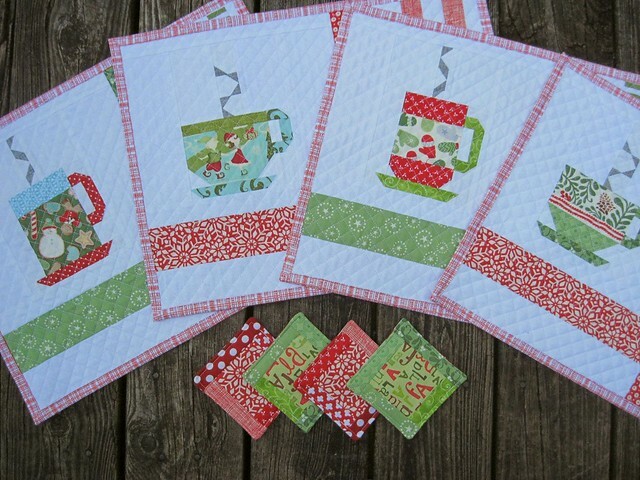 So happy to have found a great application for this Paint Chips fabric! The pattern is well written with good descriptions of each step. 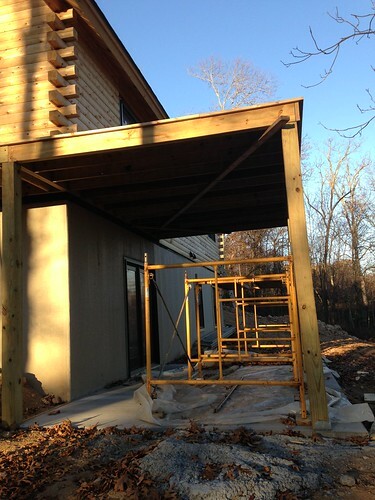 There are a ton of pictures - one for every step of the process. All these pictures can look a bit overwhelming at first, but if you just follow the instructions one at a time it all comes right together just as it's written. This is the first time I've done a flat zipper as shown on the bag front and it was not hard at all. I did add a bit more top stitching than the pattern called for - mostly because I just really like the look of top stitching. 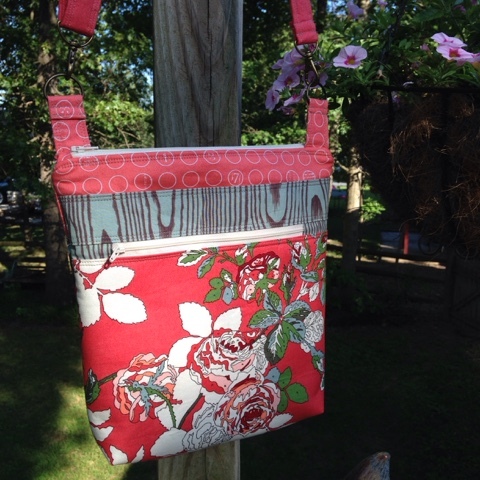 The pattern is written for optional swivel hooks on the strap which I chose to use. In addition, I wanted the strap length to be adjustable so I shopped around and found a slide adjuster in the same antique brass as the swivel clips. The finished bag dimensions are 11 tall by 10" wide x 2" deep. I definitely would make this pattern again, and might even try making it an inch taller and wider. 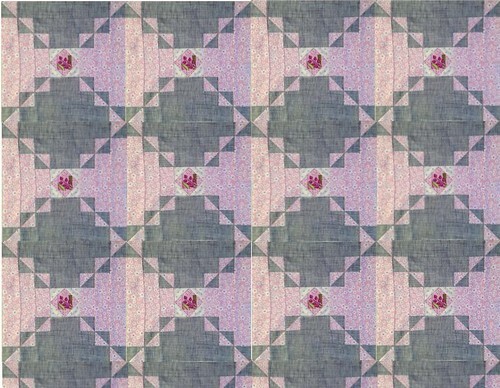 All in all it's a great pattern, and it's so fun to pick out coordinating fabrics for each part! Tomorrow I'll start using my new messenger bag! 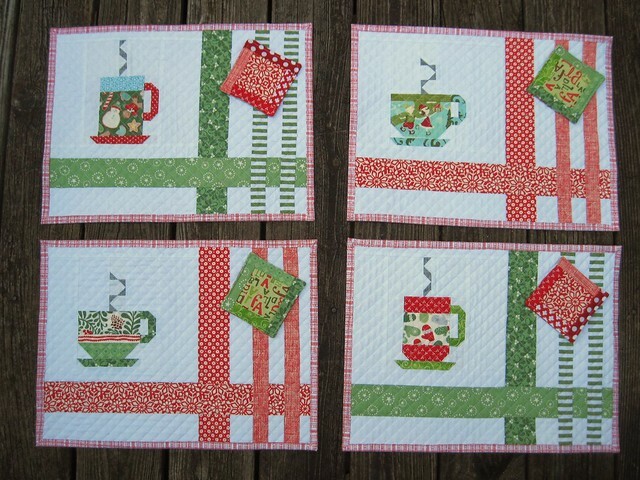 This young couple are both avid coffee and tea drinkers so of course the In From the Cold steaming mugs patterns came right to my mind when I was thinking of what to make for them. 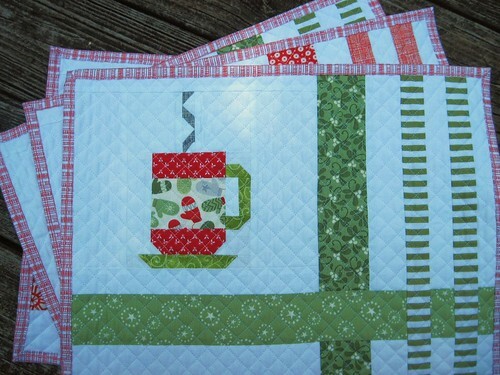 Although I knew I wanted to make the mugs, I has no idea for the overall placemat design. 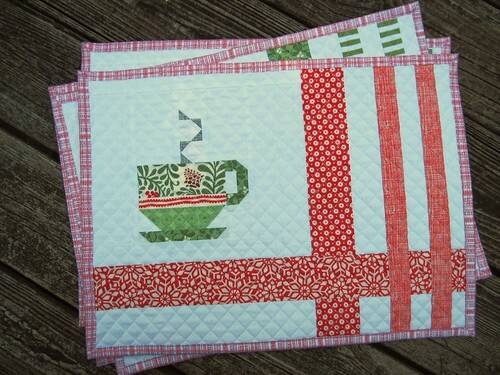 After I got the four mugs made I did a simple Google image search for quilted placemats to find some inspiration. As soon as I came across the Lines in the Sand placemat pattern I knew I'd found the perfect setting! 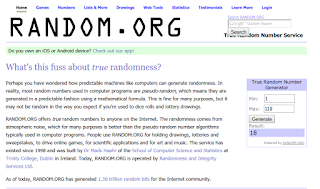 Quiltmaker's 100 Blocks Magazine Drawing Winner! What an exciting week this has been! 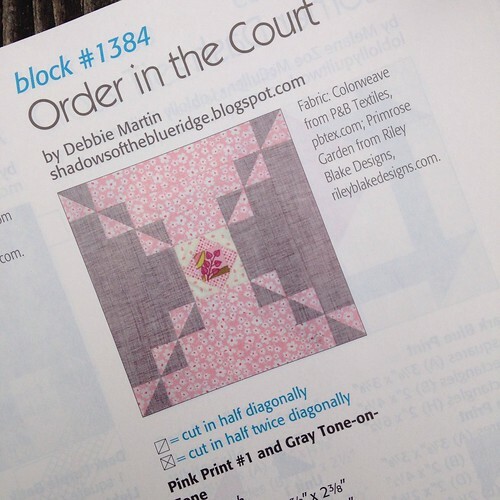 I hope you've enjoyed visiting each of the blogs for Quiltmaker's 100 Blocks, Volume 13 block designers...I know I have :o) It's always fun to read about the design process of a quilt block ~ and get some layout options! 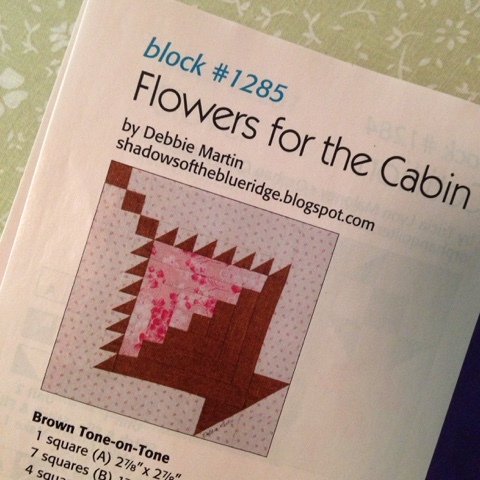 If you make Flowers for the Cabin I sure hope you'll stop by my blog and let me know, or tag me on flickr or Instagram so I'll be sure to see it! For the magazine drawing I asked readers to tell me about their sewing machines - what they like, what they don't like. I read about many great machines, from featherweights all the way up to mid-arm machines. Thanks for sharing your insights with me! 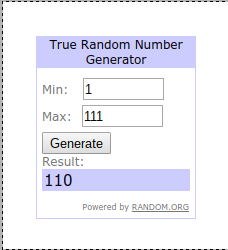 I used the Random Number Generator to pick a winner for an issue of 100 Blocks Volume 13 to be sent directly from Quiltmaker's. The winner is No. 110!! Hooray!! 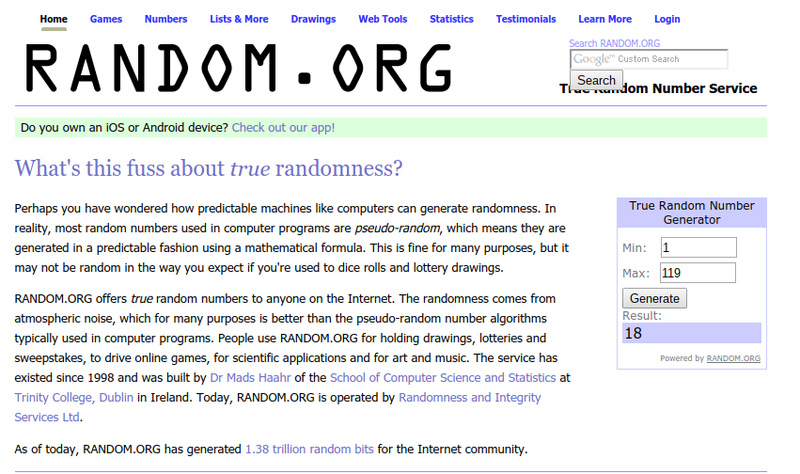 I've sent Karan an email to let her know she is the magazine winner from my drawing. 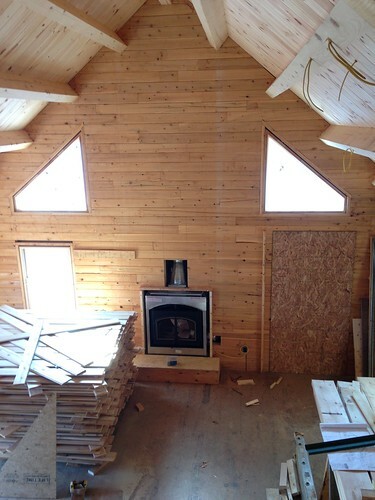 To add to the excitement of the week here is the very first progress shot of our log cabin! 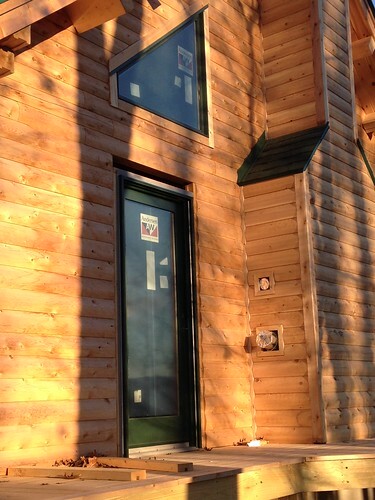 One of our future neighbors snapped this photo and sent it to us this morning! We can't wait to go by and see. Hopefully there will be many more pictures to share through the summer. Thanks again for joining me as we celebrate 100 Blocks Volume 13! 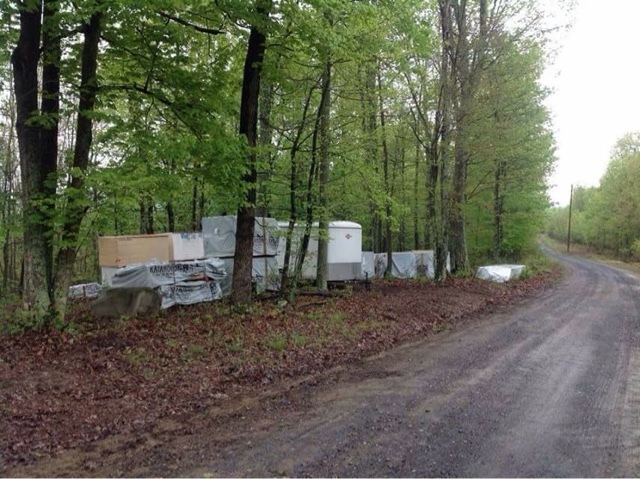 I hope to see you stop by my blog again ~ If you are not already following Shadows of the Blue Ridge you can sign up using Bloglovin, Follow by Email, or Google Friends Connect. All these options are available on the top right sidebar. If you do, be sure to leave a comment so I know you are a new follower :o) Hope you have a great week!